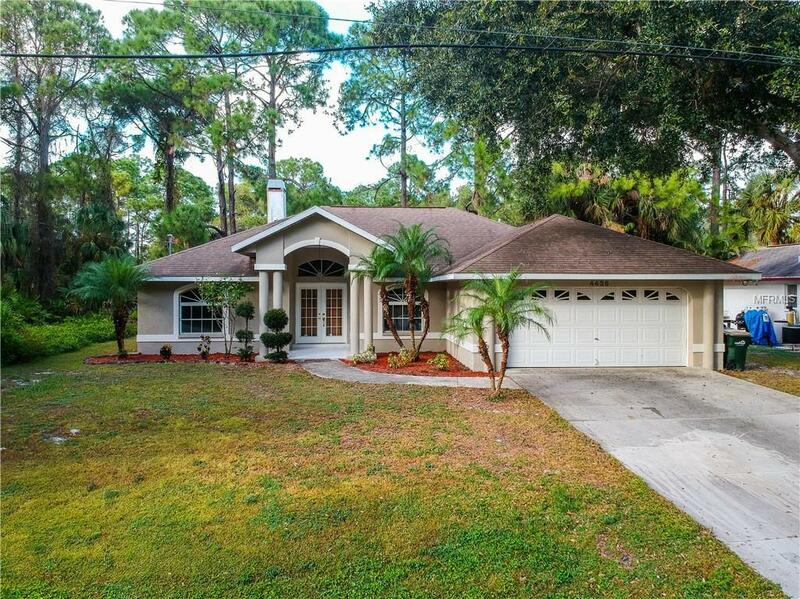 A drive down Sumter with it's illuminated Welcome to North Port sign, meticulous landscape and lovely water features charts your path to this commuter friendly home. Just moments from I-75, the location could not be more convenient. With a greenbelt to the rear, your ongoing privacy is protected. The outside has been freshly painted with a modern & complementing color choice. With over 1700 sq ft of living space in an open floor plan, the home is suited for all lifestyles. Whether your family is growing or downsizing, you will find the space comfortable. The kitchen acts as the cockpit of the home. The family chef can work their magic while continuing the conversation with their guests or catch up with the children. Stainless front appliance package conveys. On formal nights, serve dinner in the dining room and for those casual times dinette works well. No need to struggle for bathroom time, the master suite is spacious and features his/her sinks. The guest bedrooms are split from the master offering privacy and peaceful rest. This is the time of the year to throw open the sliding doors and let that amazing breeze refresh the home. Expand your living space outdoors onto the screened lanai. Kick back in the rocker and take a moment to relax while overlooking your backyard alive with nature. The laundry room is indoors so it makes the wash less of a chore. North Port is a family-oriented community rich with parks and recreation. A place where your neighbors become family.